Last chance: We only have 5 left - This product will not be available again once our stock runs out. 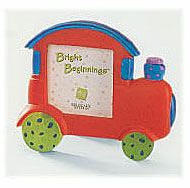 Frostique Frame - Train - 3 1/2 to 4 x 5 to 5 1/2"
Frostique Frame - 4" x 5 1/2" with glass insert. Holds 2 1/2" x 2 1/2" photo. Buy 1 for $6.99Buy 2 / Save $0.37!Buy 3 / Save $1.40! Size (inches): 1.38" X 5.91" X 4.92"
Sport Corner: Bobbling Frame - Baseball - 7 x 3"
Sport Corner: Bobbling Frame - Golf - 7 x 3"
More Photographs - Frostique Frame - Train - 3 1/2 to 4 x 5 to 5 1/2"
End of More Photographs - Frostique Frame - Train - 3 1/2 to 4 x 5 to 5 1/2"